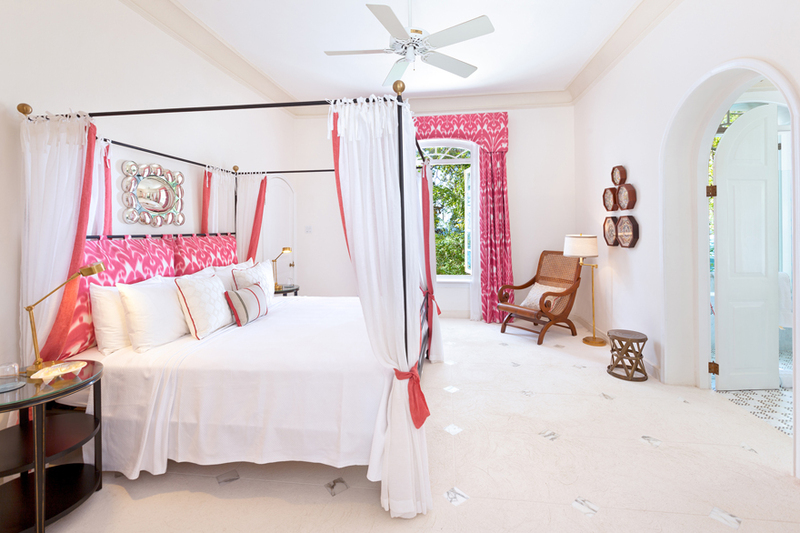 The master bedroom features a beautiful four-poster king bed, pristine white linens and unique artwork, including a handwritten letter by Oliver Messel and a collection of antique Sailor Valentines. Large windows offer stunning views of the Caribbean Sea. The master bathroom is beautifully finished in black and white marble, with a double vanity sink, bidet and stunning open-air double shower with sea views. There is also a walk-through dressing room and coffee and tea station featuring a minibar and Nespresso Machine. 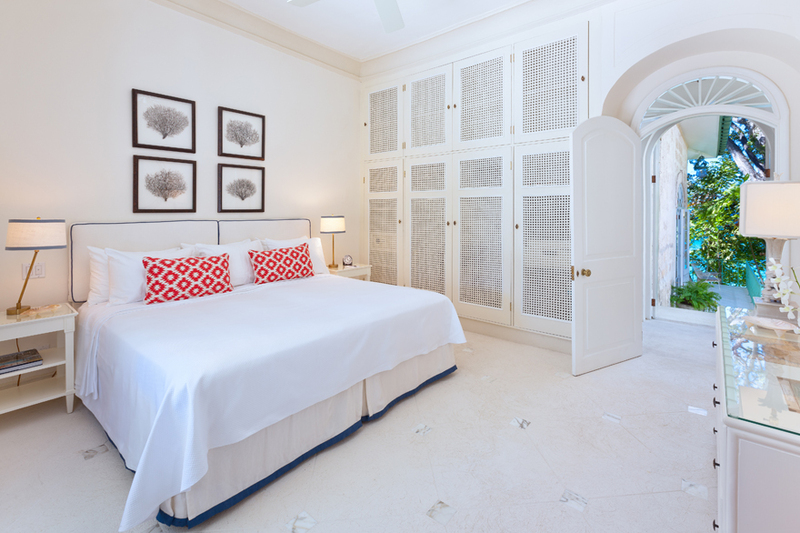 This guest bedroom, located in the main house, is decorated in a stunning white décor with accents of red and cornflower blue. The room features a king-sized bed that can be unzipped into two separate twin beds should the guests prefer. The en suite bathroom is finished in marble and mosaic tiling imported from Italy; it has a shower and single vanity sink. 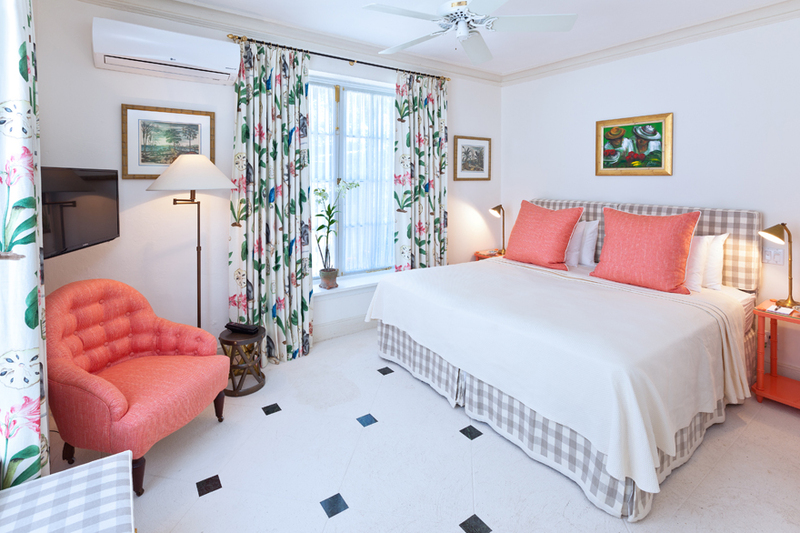 This guest bedroom, located in the main house, is decorated in a cream décor with accents of coral. 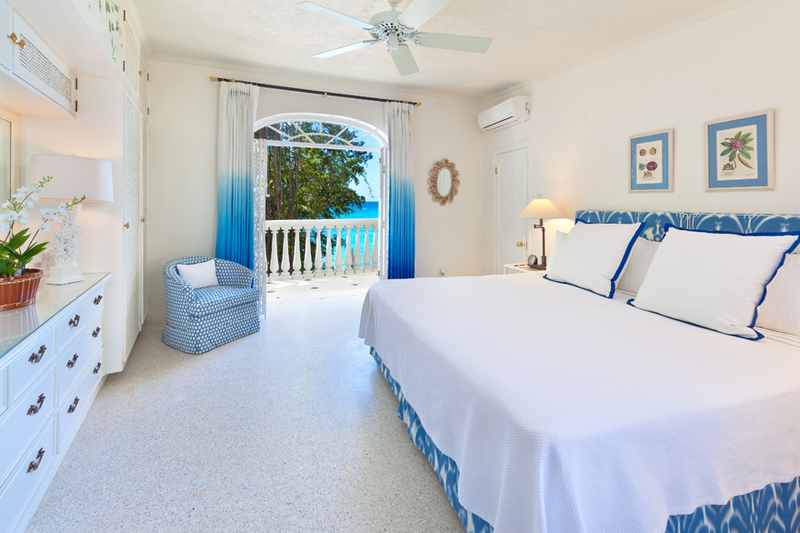 This bedroom offers equally breathtaking views of the Caribbean Sea and Gully; it features a king-sized bed that can be unzipped into separate twin beds. The en suite bathroom is finished with marble and mosaic tiling imported from Italy. It has a shower and single vanity sink. Finished in a blue motif with ombré floor to ceiling curtains and decorative shellwork, the bedroom has a delicate hand-painted mural that gives it the nickname of the Hummingbird. 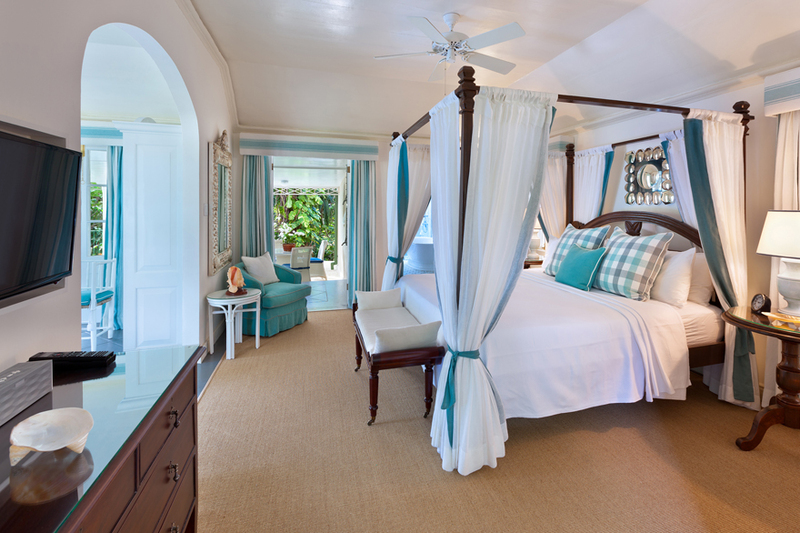 This bedroom offers equally breathtaking views of the Caribbean Sea and Gully; it features a king-sized bed. Finished with a citrus motif including beautiful ombré curtains, seated vanity and original French doors, the room has a beautiful hand-painted mural that gives the room its affectionate nickname as the Green Monkey. 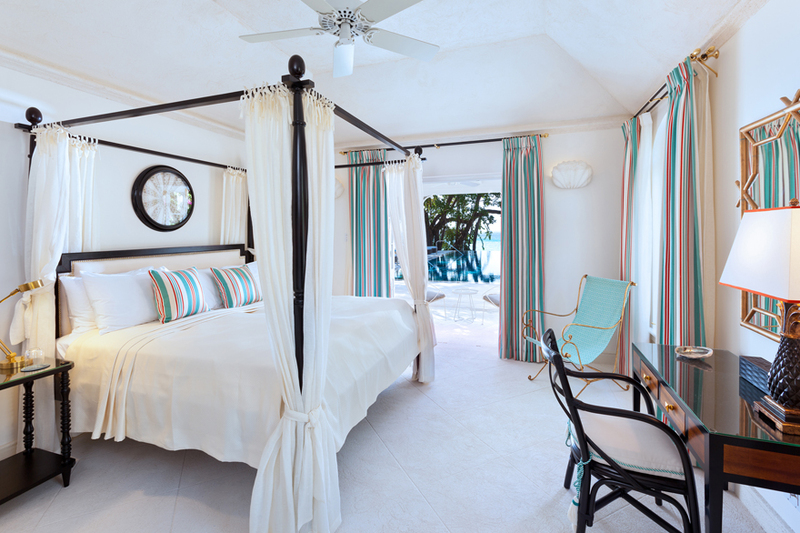 With a magnificent view over the infinity pool to the Caribbean Sea, this suite is decorated in an elegant style with king-size four-poster bed, sheer floor to ceiling curtains and original Oliver Messel drawings. A walk-through dressing room leads to the en suite bathroom with open-air shower and double marble vanity. The suite connects with Sunset North. Please note that children under 12 are not permitted to stay in the Pool Cottage for safety reasons. 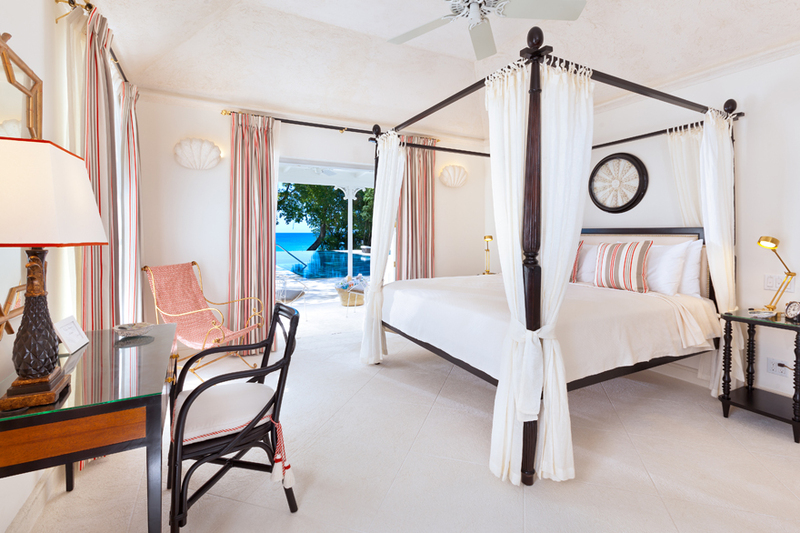 With a magnificent view over the infinity pool to the Caribbean Sea, this suite is decorated in an elegant style with king-size four-poster bed (that can be unzipped into two twin mattresses), sheer floor to ceiling curtains and original Oliver Messel drawings. A walk-through dressing room leads to the en suite bathroom with open-air shower and double marble vanity. The suite connects with Sunset South. The Tea House, located in the garden adjacent to the Gully, is a two-room cottage ideally appointed for young families. The master bedroom features a king-sized bed, whilst the sitting room has two twin-sized Murphy beds. Decorated in a soothing teal and white pallete, it has a dressing room and stunning en suite bathroom with a double rain shower open to the sky above, as well as an inviting stand-alone tub. The cottage has a spacious wrap-around patio and wet bar with Nespresso machine. The delightful guest bedroom is decorated in a simple, airy style; the flooring features a signature Messel Green finish. It features a king-sized bed which can be unzipped into two separate twin beds should guests prefer. The en suite bathroom features an italian mosaic shower and single vanity sink. Pavilion South is a connecting suite with Pavilion North. The delightful guest bedroom is decorated in a simple, airy style; the flooring features a signature Messel Green finish. It features a seated vanity and a king-sized bed which can be unzipped into two separate twin beds should guests prefer. Pavilion North is a connecting suite with Pavilion South. Crystal Springs features 10 en suite bedrooms situated in five buildings across the property, providing a unique accommodation offering ideally suited for families and friends. Each bedroom is luxuriously appointed with beautiful linens, quality furnishings and artwork; each with an enchanting view of the sea, gully or gardens through large windows framed by billowing floor to ceiling curtains. Most bedrooms feature king-sized mattresses that can be unzipped into two separate twin mattresses should the guest prefer. The Main House features the master suite and two guest bedrooms. 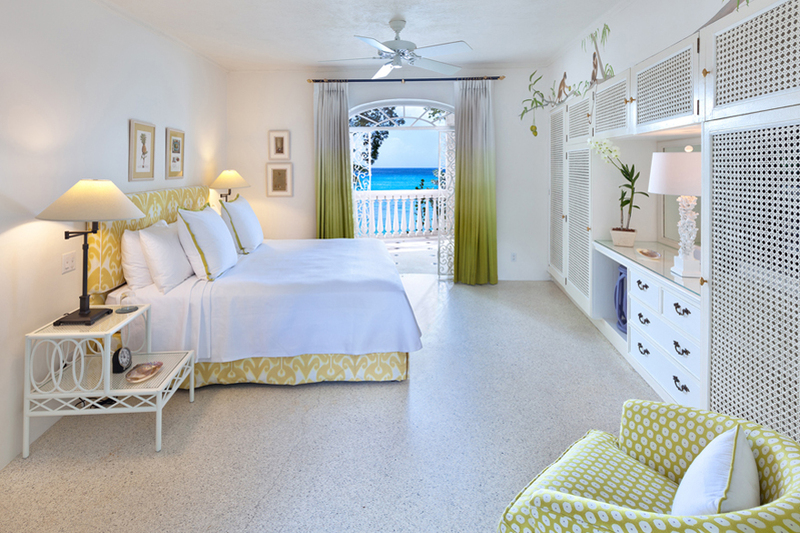 The Annex, adjacent to the main house, offers two bedrooms with an elegant oceanfront terrace overlooking the Cove Beach. 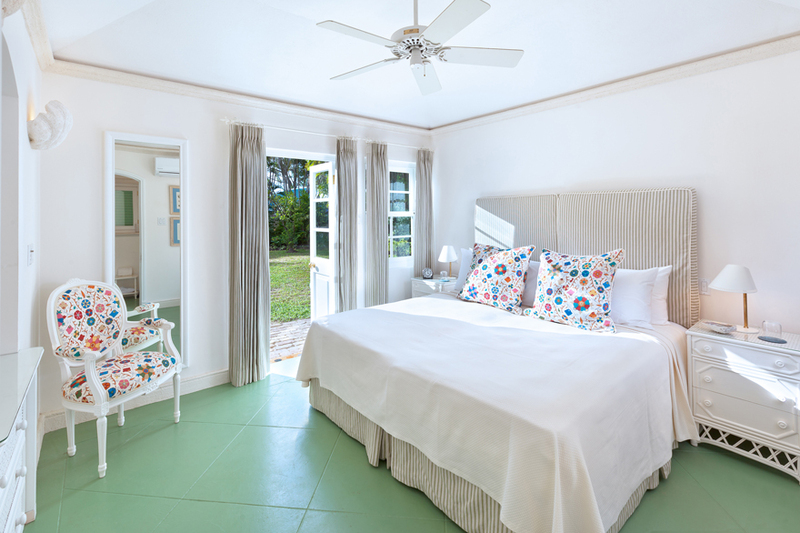 The bedrooms are each finished with handpainted murals, elegant linens and charming en suite bathrooms and unobstructed views of both the Caribbean Sea and private gully. 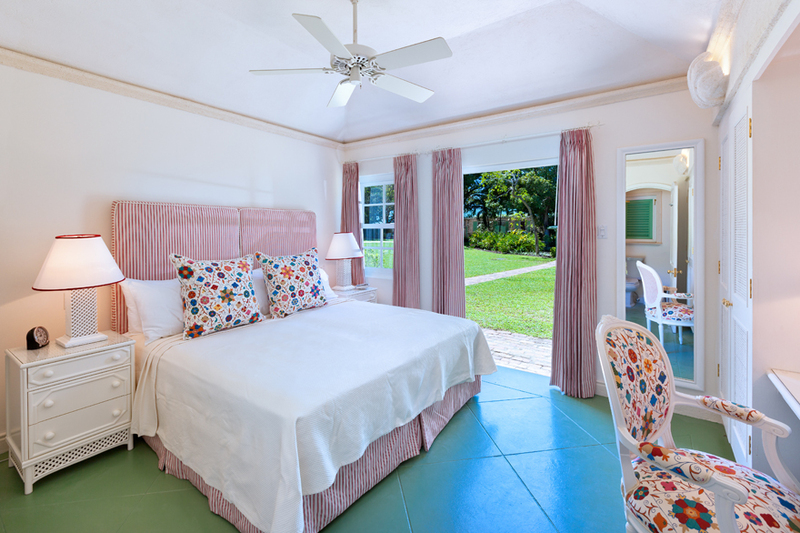 The Pool Cottage, overlooking the infinity edge swimming pool to the Caribbean Sea, offers two connecting guest bedrooms furnished in an elegant Caribbean style. The Tea House, located in the garden adjacent the Gully, is a two-room cottage ideally appointed for young families, featuring both a king-sized bed and two Murphy beds. The Pavilion, located in the garden at the eastern edge the property, offers two connecting guest suites.